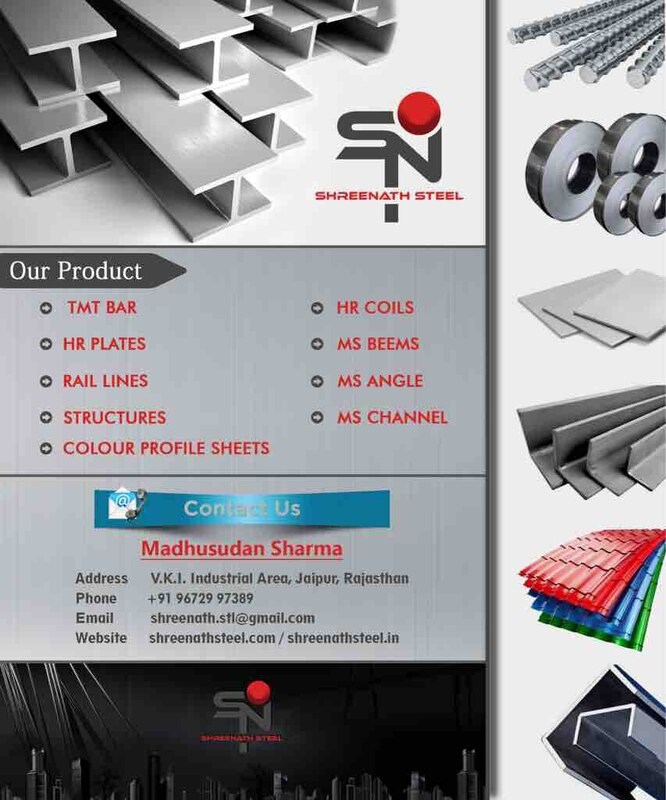 SHREE NATH STEEL All kinds of Iron & Steel Stockist & Suppliers 09672997389 Established in 2011, Shree Nath Steel Company is leading steel supplier and stockist in Jaipur and we are ISO 9001:2008 certified. We are in relation with Jindal Steel & Power, RINL, Tata Steel, Sail, Gemini Steel and JSW for business. We do serve products from all these reputed companies. At Shree Nath Steel good behaviour with delight to customer is our main priority. We serve products which are rich in quality and standards, to make sure that our customer always receives genuine products. Shree Nath Steel is a competent partner for various steel products and is a specialist for complex stainless steel grades. A wide majority of customers choose Shree Nath Steel as a preferred supplier for commercial Stainless Steel products. Each product of our range is tested as per the internationally accepted standards using various test procedures. In addition, we also facilitate specific testing as per the client's requirement. For quality control, we have a team of quality checking staff. Perseverance and rendering are our key tools for the success, which we achieved in past years. Our consideration behind all this is: "You can buy a person's time; you can buy their physical presence at a given place; you can even buy a measured number of their skilled muscular motions per hour. But you can not buy enthusiasm . . . You can not buy loyalty . . . You can not buy the devotion of hearts, minds, or souls. You must earn these. "